I will never do justice to anyone I cover in my “Thought Provoking People” posts, but the only thing I can do is to try to draw attention to these people who may be forgotten or overlooked or taken for granted. Such is the case, yet again, with Cyril Wilde. I choose to leave off the “Holland” as I think of him, but will refer to that last name later, because, in my mind, the name creates a different person. My curiosity about Cyril Wilde began a few years ago, when I decided to teach Oscar Wilde’s The Picture of Dorian Gray. In our survey classes at UA, we are required to teach a novel in the later British literature course. Up until three years ago, I always taught Mary Shelley’s Frankenstein, but I was sick of it and decided to teach a novel I had never read (but that was on my comps reading list): The Picture of Dorian Gray. Wilde is, of course, a Victorian, but he is a late-Victorian writer and not really someone I can use in my dissertation. So, my familiarity with him extended to material I had read in survey courses and a literature class focused on homoeroticism in Victorian texts that I took some years ago. Anyway, as I prepared to teach the novel, I searched around for movies and photos to use during our week-long discussion of the book. I finally had a “technology equipped” classroom and I planned on taking full advantage of it! The first day of teaching, I decided to spend a good bit of time on Wilde’s biography so that students would be prepared for some issues that would come up in our conversations. Included in this coverage of Wilde’s life, I showed the students several photos of Wilde, his wife, their two boys (Cyril and Vyvyan), and the Douglas men (who would be the catalyst for everything changing in Wilde’s life). And when I gathered these photos, I came across one that astounded me—a photo of Cyril, Oscar’s oldest son, and his mother, Constance. I don’t know why I feel so connected to this portrait—but my connection with it is intense. Before I found out about Cyril’s life, it merely brought out a mother’s instinct in me, but now that I know more about him and how he suffered, I want to jump in that photo, take him and hug him without letting go. Only a few years later would he change completely. Never again would he return to such an open clarity of expression or a such a relaxed posture. As for the photo itself, I love looking at it, because it is both Victorian and modern all at once. It captures the nineteenth-century formality expected from women like Constance, who struggled with her role as wife to a man incriminated for what were, at that time, unspeakable “crimes.” But look at that little boy. When I saw this photo, I was amazed for a couple of reasons. First of all, look at the smile on his face. This is very rare in Victorian studio photography. Taking a picture at this time was an ordeal. Professional photography sessions meant sitting still for long periods of time and being dressed in your best clothing. The children and adults in nineteenth-century photos appear bored at the least and miserable at the most. Rarely is there a smile from anyone involved. And, yet, in this photo, we have such a captivating, natural scene—one that could be in any photo taken of a mother and child today. Also unusual is the appearance of Cyril, himself. While his mother is dressed and groomed predictably, Cyril is ethereally gorgeous with his messy hair and casual clothing. You can almost feel the warmth of his little arms (I believe he is about five here) around her neck. His comfort with and physical closeness to his mother, along with his smile, show us that their relationship is warm in spite of her traditional pose. Yes, it still shocks me every time I see the image. Never have I seen such a natural photo. And never have I wanted to know more about family dynamics. So, recently, as I once again taught Wilde (this time only a portion of De Profundis...I actually decided to teach Frankenstein again this semester and now wish that I had not), I found myself fascinated by this picture once more. I started researching and found out that not much exists in the way of Cyril’s life—a life that, it turns out, was cut tragically short. But what I did find, through secondary sources and through his brother’s memoir of life after “The Trial,” allows us to get a glimpse of a boy and young man who was astonishingly complicated and wise beyond his years—but tortured all the same. Cyril Wilde arrived in the world on June 5, 1885. He was the first child of Oscar and Constance Wilde, and was born into unusual circumstances to say the least. The father, famous for his plays and writing, was eccentric and unconventional, as we know, but this unconventionality extended to the role of father as well. He adored his son and was a very hands on parent, something rare among Victorian fathers (and mothers) at the time. A second son, Vyvyan, was born in 1886. And it is through Vyvyan that we learn the most about Cyril’s personality and life. Vyvyan, in his memoir Son of Oscar Wilde (where most of the information for this post comes from), explains that Cyril was the favored child in the family, for when Vyvyan was born there was disappointment that he wasn’t a girl. Certainly, Vyvyan was the less outgoing of the two boys, because all accounts of their childhood portray him as the follower of his older, rambunctious brother—a child Vyvyan describes as “a tough little animal with higher spirits than I possessed” (25). Cyril, from what I can tell, appears to be the stereotypical English boy we read about in Kipling’s Stalky & Co. stories or Hughes’s Tom Brown’s Schooldays. He was fascinated by adventure and boys’ novels and the British Empire. He wanted to be a navy officer (though he would eventually become a soldier), and he had aspirations to join the service very early in life. As I said, perhaps these dreams of Cyril’s were inspired by the books he read. Vyvyan notes, in his book, that some of the last presents his father gave him were books by Kipling. A child’s imagination is a wondrous thing, and I am sure that the exotic locales of India (where Cyril would indeed end up) and the camaraderie and adventure of the soldiers seemed appealing to a young boy. As far as their early childhood, Vyvyan explains that Cyril loved to play soldier, and once even stabbed him in the backside with a sword, an event that traumatized Cyril as much as it did Vyvyan! But their father was a powerful presence in their lives and the children loved their father deeply. As Vyvyan explains, “Most small boys adore their fathers, and we adored ours; and as all good fathers are, he was a hero to us both. He was so tall and distinguished and, to our uncritical eyes, so handsome. There was nothing about him or the monster that some people who never knew him and never even saw him have tried to make him out to be. He was a real companion to us, and we always looked forward eagerly to his frequent visits to our nursery” (41). And Oscar would really play with the boys, too—no formal visits with a slight handshake for these three. “My own father was quite different; he had so much of the child in his own nature that he delighted in playing our games,” Vyvyan said years later. “He would go down on all fours on the nursery floor, being in turn a lion, a wolf, a horse, caring nothing for his usually immaculate appearance. And there was nothing halfhearted in his methods of play....Like other fathers, he mended our toys…He also played with us a great deal in the dining room...When he grew tired of playing he would keep us quiet by telling us fairy stories, or tales of adventure, of which he had a never-ending supply” (41-42). The stories were a favorite for the children, and both Cyril and Vyvyan grew up loving literature. Oscar would come up with stories just for them and inscribe the printed versions to them as well. His favorite story, Vyvyan implies, was The Selfish Giant. Apparently telling this tale was so emotional for Oscar that he would cry, something that affected Cyril. Vyvyan explains that Cyril asked his father why he cried each time he told the story, and Oscar answered, “[Because] really beautiful things always ma[ke me] cry” (42). Vyvyan both loved and lamented this quality in his father, for he believed that Oscar “lived in a world of his own; an artificial world, perhaps, but a world in which the only things that really mattered were art and beauty in all their forms. This gave him that horror of conventionality which destroyed him in the end” (43). In any case, childhood for both Cyril and Vyvyan was cut short. The first stage occurred when both were sent away to separate schools (in 1894) at very young ages (Cyril was nine and Vyvyan was seven and a half). Cyril’s school meant to prepare boys for the navy. It was sparse and hard, the staff unwilling to coddle their students. But Cyril appeared to love it. No doubt, he felt that he was part of a military community—one he had read about for so long in his adventure novels. Vyvyan explains that Cyril’s school was “rather a Spartan place with no indoor staff at all, except, presumably, in the kitchen. The boys themselves had to make their own beds, empty the slops (there was no such thing as running water in schools in those days), and keep the place clean and tidy generally. From what my brother told me, I gathered that he rather liked his school” (46). “THE TRAIN HAS GONE. IT’S TOO LATE.”—Oscar Wilde’s words at the realization that he was about to face trial. The boys weren’t at their schools for very long, because in 1895, life changed forever. In February of that year, rumors of Oscar’s affair with a young gentleman, Lord Alfred Douglas, reached the man’s father—the Marquess of Queensberry. Enraged, the Marquess began hounding Oscar and eventually went so far as to leave a card in full public view at Wilde’s gentleman’s club. The card read: “For Oscar Wilde, posing somdomite.” (Yes, the jerk couldn’t spell sodomite…so I guess that is something, anyway.) In any case, Oscar felt that he had to publically fight the charge and he called for the prosecution of Queensberry. Charge: Libel. The trial began in April, and suddenly all of Oscar’s affairs came to light in a way that caused him to be the one subjected to prosecution. Witnesses, evidence in both human and literary form, testified against him. The power of the Marquess could not be denied. At the end of the trial, Queensberry was acquitted and Oscar was responsible for paying all of the fees—which left him bankrupt. Their father’s name was ruined and all of the beautiful words he had written and stories that he had created were seen as trash—in spite of the fact that only a few weeks earlier people eagerly were consuming them. Everything by Wilde was tainted, poisoned. “The two plays running in London [in progress at the time of the trial] lingered on, but they were eventually withdrawn on April 27 and May 8,” Vyvyan explains. “All books by Oscar Wilde were removed from bookseller’s shelves and he, who had been making an income of some thousands of pounds a year, suddenly found himself penniless. Had it not been for the generosity of a few friends he would have been unable to pay for his defense” (47). While Vyvyan remained in ignorance of his father’s “crimes” until much later in life, Cyril found out right away, though he shielded Vyvyan from his discovery (and would remain silent about his father for most of his life). Right before Cyril died, he finally wrote to Vyvyan and said of finding out about his father’s charges, “‘I was nine years old when I saw the first placard [with the charges written on them]. You were there too, but you did not see it. It was in Baker Street. I asked what it meant and I received an evasive answer. I never rested until I found out,’” Cyril explained. But as Vyvyan said, “His opportunity for [discovery] soon arose. He went to stay with cousins of my mother’s in Ireland, where it was intended that I should follow him later. While he was there he read newspapers left lying about and realized that something was desperately wrong. He was terribly distressed, and the hackneyed expression 'he never smiled again' was for him almost true” (48-49). From the moment of his discovery, I believe, based on what I have read “between the lines,” Cyril went into survival mode. Every action from thence forth was one of protection—the need to protect his mother and his brother. Too much weight for a nine-year-old to carry. He took on the responsibility in a way that went beyond his years. It would destroy him. Between his constant need to protect and the panic that he experienced when he felt he was about to fail, Cyril would struggle to come to terms with his own sense of self and masculinity—and with his need to continue to love his father. Cyril, though he would try to keep himself from it, could never forget what he would call his “purpose” or the feelings of deep love he held for his father. The child began to die that day of the discovery. All of us have light and dark within us, but when we are very young and exposed to something truly traumatic, it is hard to see the good. This is hard enough to deal with in our own world, but imagine what it must have been like as a child in the Victorian world. Cyril, making his discovery in Ireland and living amongst Constance’s family who never liked Oscar to begin with, became, understandably, upset. Though Vyvyan was supposed to join him there, the press exposure was too great and Constance decided that it was best if the boys were sent abroad. From what Vyvyan says, the French governess paid no attention to them and could have cared less if someone was watching them. They had free reign to roam on the ship to France, and, once there, she would leave them for hours in the hotel, not even giving them proper meals. For children already feeling instability, their time with the French nanny must have made them feel alone and abandoned in the world as well. Constance Wilde remained behind as the boys traveled to Europe, but her time in England, spent trying to support and help Oscar as much as possible, was extremely difficult. In the end, “she too was driven from her home by the entrance of bailiff’s men, and the subsequent sale of all the contents of the house” (49). Vyvyan notes that the “sale [of their home’s contents] was a scandalous piece of barefaced robbery. Even before it took place, the house was full of riffraff, souvenir-hunting and stealing anything they could lay hands upon….Books, of inestimable value for their association interest, were sold in bundles of twenty or thirty for two or three pounds a bundle. Among them were first editions of all my father’s books with inscriptions to my mother, to my brother and to myself, which were kept in my mother’s bedroom, in a special bookcase to the right of the door. They have never reappeared” (49-50). Eventually, the boys made their way to Switzerland. They spent time with Russian Countesses and were kicked out of a hotel when news of the trial reached the manager and he began to see them as “pariahs and undesirables” (59). Finally, Constance made her way to them, but even then she would not speak of Oscar in front of the boys as a group. She did, however, discuss the matter with Cyril, for no doubt he brought it up. “[Cyril] wanted to shield me and to keep me in ignorance of the truth, so that I should not suffer as he did,” Vyvyan said. “The only person with whom he ever discussed my father was my mother. This self-inforced reticence turned him, while yet a child, into a taciturn pessimist” (51). Eventually, the three made their way to an their Uncle Otho Lloyd’s home, where one day, in an act that would be the death knell for Cyril’s childhood, the boys were called into a family meeting presided over by their mother and uncle. My heart broke when I read this passage. And from this point onward, the question of identity for Cyril is an obsession. The children were soon left again, because Constance received word that Oscar’s beloved mother had died and felt she must give him the news herself, so I am sure that they felt doubly abandoned. When Constance returned, she tried to insert a bit of normalcy into the boys’ lives by sending them to school. Her first choice was a disaster. She decided upon a German school because it actually used Oscar Wilde’s stories as textbooks, and she felt that even if the true names of the boys were discovered that maybe they would be safe from ridicule. However, the teachers were cruel, especially to Vyvyan. The boys eventually were expelled from the German school because, when the master of the class started beating Vyvyan, Cyril “always fiercely protective of me as being more delicate than himself,” Vyvyan explains, “retaliated by kicking the master violently on the shins and driving already powerful fists into his stomach, while I attacked him from the rear” (74). This incident, at least on Cyril’s part, shows, I think, an incredible release of anger and frustration. Though the boys had a history of being rambunctious, at nine- or ten-years-old a child carrying the baggage that Cyril carried had to be under a tremendous amount of pressure. Following their expulsion, the children were sent to Neuenheim College, a English school in Heidelberg. The environment, though Vyvyan found it distasteful, suited Cyril perfectly. The school was run in much the same fashion as his former school and at least surrounded them with the familiar English lifestyle and values that made them feel secure. Vyvyan remembers the brutality of bullying and rough sports, but Cyril excelled in marking his place as part of the crowd (though not really making lasting or strong friendships ever in his life) and as an athlete. Cyril seemed, from Vyvyan’s account, to relax a bit and fall into the world that he saw would prepare him for a military career in the Empire. “We at Neuenheim,” Vyvyan said, “had all the traditional contempt for foreigners of the English boy of the period, and we honestly believed that any English boy could take on two foreign boys in a fight and beat them with the greatest ease” (75). “My brother and I had fled from England with all our summer and winter clothing, but until this time we had had no occasion to wear our cricket flannels, which had been carefully wrapped up in brown paper and stowed away from moths. When the first half-holiday arrived and we went to our dormitory to change for cricket, we were aghast to find that, in the general Wilde-Holland change-over, these garments had apparently been overlooked and all bore the name Cyril Wilde and Vyvyan Wilde prominently displayed upon them. Luckily they were all written with marking ink on tapes and sewn on to the garments, and I can see my brother now, in the comparative seclusion of the washing place, frantically hacking away at the tapes with his pocket knife. The most difficult name to remove was mine from my cricket belt, as the stitching had gone deep into the webbing. Eventually, Cyril cut out the center of the tape, leaving the edges adhering to the belt. I find this so sad and so telling of Cyril and the anxiety that he had to be feeling constantly. His panicked, secretive response is devastating to read and I can just see him crouched in some bathroom in the school, hurriedly picking apart the labels and threading while sick to his stomach that someone might discover him in the act and demand to know what was happening. The boys didn’t mention their father, but he constantly thought of them. During the school holidays, Constance had professional photos taken of the boys and sent them to Oscar, who wrote of receiving them: “I have heard from my wife—she sends me photographs of the boys—such lovely little fellows in Eton collars—but she makes no promise to allow me to see them: she says she will see me, twice a year, but I want my boys” (87). According to Vyvyan, Oscar kept the pictures with him until the day he died, for he would never see his children—or their likeness—again. Vyvyan became so unhappy at their school that he asked to be placed in a new one. He and his mother discussed it and they chose a Catholic school in Monaco. The new environment was different, but Vyvyan adjusted well. Cyril remained at Neuenheim. However, soon their mother died and the boys were forced to return to England in the summer of 1898. Constance wrote a letter to each of the boys before she died, though only Vyvyan’s remains. She told him, “Try not to feel harshly about your father; remember that he is your father and that he loves you. All his troubles arose from the hatred of a son for his father, and whatever he has done he has suffered bitterly for” (112). After her death, the boys were to return to England. Vyvyan was escorted by a priest, but Cyril, tired of waiting for someone to accompany him, made his way back on his own. Though only thirteen-years-old, Cyril traveled from Neuenheim to England without a guardian, and Vyvyan said “it showed initiative,” and that “when he arrived, [we saw] that he had outgrown all his clothes” (117). 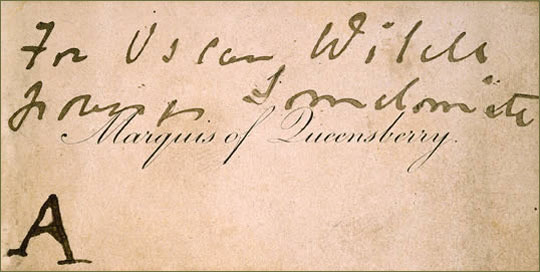 The boys were in a state of limbo for quite some time, staying in the country with relatives, where Vyvyan found a copy of The Happy Prince, “[b]ut…had a great shock when I saw that the name Oscar Wilde had been scratched off the cover and that a piece of stamp paper had been pasted over it on the title page” (118). Cyril was dealt a double blow. Not only was he now orphaned and separated from his only close blood relation, he was also denied entrance into a school that prepared men for entrance into the Navy. The Navy refused to take Cyril, so he enrolled in a school that prepared men for the army, instead. As the years passed, the boys, though writing to one another, grew somewhat apart. Rarely seeing one another, they dealt with their history on their own. Vyvyan coped by scouring second-hand bookstores, looking for old or pirated copies of his father’s work. He finally found out, at age eighteen or nineteen, the nature of his father’s charges. But Vyvyan accepted things rather well, probably because he found these things out as an adult. Certainly he struggled with wanting to redeem his father without appearing a villain to society, but I don’t sense that his worry over this was extreme. Cyril, however, fought his own demons as an adult. He was accused of drunkenness, and would waver between longing for and hatred of his father. I believe, given what he went through at such a young age and living in the society he lived in, that this is normal. “I am glad you say that he loved us. I hope that at his death he was truly penitent; I think he must have been if the joined the Catholic Church and my reverence for the Roman Church is heightened more than ever. It is hard for a young mind like mine to realize why all the sorrow should have come on us, especially so young. And I am here among many happy faces among boys who have never really known an hour of sorrow and I have to keep my sorrow to myself and have no one here to sympathize with me although I am sure my many friends would soon do so if they knew. But when I am solemn and do not join so much in their jokes they stir me up and chide me for my gloominess. It is of course a long time since I saw father but all I do remember was when we lived happily together in London and how he would come and build brick houses for us in the nursery. I only hope that it will be a lesson for me and prevent me from falling into the snares and pitfalls of this world. I first read of his death in a paper at breakfast and luckily one cannot realize so great a loss in cold print or I don’t know what I should have done….And yet the ordinary person reads it without emotion and quite dispassionately. I think this letter beautifully shows the conflict Cyril faced. Anger: he probably felt intense abandonment by a father who lived yet who did not fight for his right to have his children. Anger: Because he too had been made an outcast and a little adult by his father’s actions. Anger: Because as an adolescent in a homophobic environment, he could not live without doubt and stigma and discomfort. And, Overwhelming Sadness: Just because of everything. I had to stop each time I came across a letter in Cyril’s own words. As he grows, he develops a beautiful style of writing and expression. He is beautiful, in spite of his anger and doubt, his roughness and unpredictability. And, yes, his predictability, as well. Cyril remained at his school, Radley, and was very athletic, keeping his secret throughout his time there. Even in the register, Cyril’s “is the only name against which the words ‘son of –‘ are still omitted” (123). After school, he served in the army, eventually ending up in India. From about 1905 until Cyril’s death, he seemed to have reached a crisis. He would, as I said, bounce between hating his father and running from his past and wanting to consume as much information about his father as possible. Vyvyan wrote to his brother when he would find copies of their father’s books, and once Cyril wrote back and sent a copy of De Profundis, Wilde’s long letter/essay written during his time in prison. What is interesting about this, is that he sent it in the exact year it was published for the first time—an indication to me that Cyril swept it up as soon as he could. “Nature only laughs at us when we try to translate her into words. The most that we arrive at is some dull picture of still life. If I sit down with a will and try to give expression to my aesthetic impressions, I am at a loss for words. Words may fix ideas, concepts; they are employed in logic, in science. But they fail to catch life on the wing, they fail to give more than a hint, a suggestion of artistic feeling. Sometimes I catch a phrase which seems to be true to the fact. But after a moment’s reflexion [sic], I recollect that it is an old phrase, used many times before, hackneyed, stereotyped. But in 1914, World War I broke out andCyril, “ardent for some desperate glory,” as Wilfred Owen would say, desperately wanted to be on the front. Vyvyan joined the army, too, and, strangely, both boys were stationed about three miles from one another in France. Cyril’s wish was “to [come to an] end in honourable battle for my King and Country.” He did indeed achieve death in service to his country. Simon Fielding, a man also “haunted” by the photo of Cyril and Constance, explained the circumstances of Cyril’s death: “On 9 May 1915, during the second battle of Neuve Chapelle, Cyril Holland was killed in a duel with a German sniper, dying with glory as he would have wished” (http://1914-1918.invisionzone.com/forums/index.php?showtopic=90585&st=50). Cyril Wilde was twenty-nine-years-old. Cyril is buried in France at St. Vaast Post Military Cemetery, Richebourg-l’Avoué. I want to go there one day. I also want to visit Oscar Wilde’s burial place in France. I enjoyed Vyvyan’s story and am grateful that he tried, in the only way he knew how, to explain his brother. I think Cyril remained a mystery to him, but, really, so much knowledge about that older Wilde boy is right there on the page. Cyril was tortured, smart, beautiful, gifted: all of the things his father was, too. They are mirrors of one another in many ways. Maybe Cyril knew it, as well. At least, I hope he did. And I hope he found at least a few moments of peace. You were, and are, loved, Cyril Wilde. What a beautiful account of Cyril's sad life. I too am captivated by his sweet smile at the age of five. I've often had the sense that perhaps he was gay which, if true, must have added to his misery. Thank you so much! I am glad someone is reading it, at least! I just feel so sad each time I think about him. He was such an interesting person. You are kind to comment and say such nice things! Thank you! That was such a moving, beautiful picture you painted of Cyril. I always felt the same attraction towards that beautiful picture of him and his mother Constance. Thank you for writing this! Thank you so much! I really appreciate your kind words! Every time I see that picture...well, my heart just breaks. I love it, but I also now know what happens later. Such a beautiful young man. Thank you for taking the time to read and comment. I stumbled across this beautiful dedication and for exactly the reasons you outline, I have always been moved by this picture since I discovered it. I have loved the work of Oscar since around age 15 and then became a bit obsessed with his life. This family tragedy shows how the pain goes through generations. Thanks for posting . Thank you so much for commenting! I remain fascinated by the Wilde boys, and I hope that scholars learn more about them. lindo texto, sempre gostei das obras de Oscar Wild, e essa foto de Cyril com sua mãe é realmente encantadora, toda vez que olho essa foto, fico imaginando como foi a vida desse belo menino, pena que teve uma vida interrompida tão cedo e muito joven ...parecia ser um jovem muito interessante e de bons conteúdos a descritos de Vyvyan seu irmão. 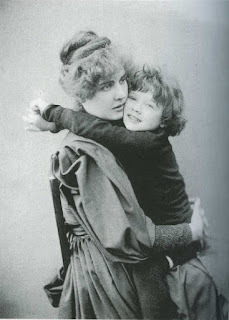 mais uma vez parabéns pelo cativante texto..
e sempre que descobrir mais novidades sobre a familia Wilde/Holland.. poste aí, adoraria ler mais e descobrir mais sobre meninos Wild..
beautiful text, always liked the works of Oscar Wild, and this picture of Cyril with his mother is really lovely, every time I look at this picture, I wonder how was the life of this beautiful boy, who lived a life sentence interrupted so early and very seemed to be a young girl ... very interesting and good content to Vyvyan described his brother. 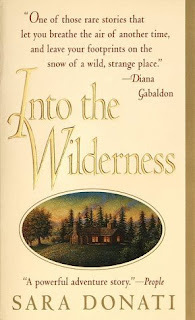 Once again congratulations captivating text ..
and where to find more news on the Wilde family / Holland .. post there, would love to read more and find out more about Wild boys .. Thank you so much for your lovely comments. 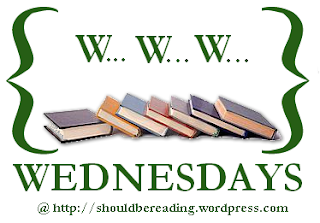 I really appreciate you visiting the blog! 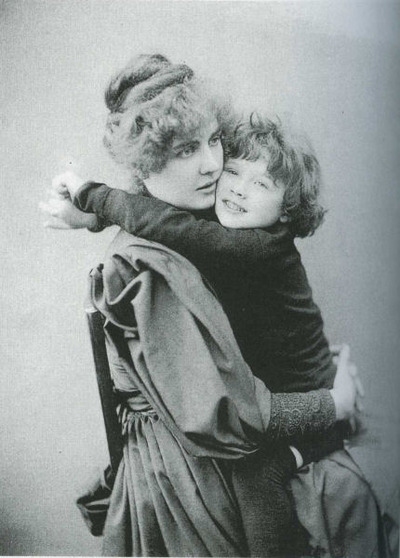 The only major source about Wilde's children that I know of is the book I used for this post. A great biography of Wilde (I think) is "The Secret Life of Oscar Wilde" by Neil McKenna. I think further study of Cyril's letters and writings is needed, but (so far) it has not happened! Thank you, again, for visiting my blog! i AM READING THE BOOK ABOUT cYRIL'S MOTHER AT PRESENT. Usually when someone is famous we forget about those who lived with him/her, sharing a life of pain or happiness. I feel for Constance but I also feel for that beautiful child of hers who had to suffer the penalties of being the child of a tortured soul just as children out of wedlock did centuries earlier. Why should innocent children be judged by something other than their actions? Like it is written, the one who did not sin is the one who can through the stone. We are all sinners and those kids were innocent at the time. Thanks for writing about him. Thank you so much for the comment and kind words. I am still captivated by Cyril's story, and I just wish that he could have lived and found peace. He was an amazing person,and I hope that he will not be lost to history. Thanks for the account of Cyril's life. I feel that to vindicate their father the name should revert back to Wilde and that Vivian's son should change it. It is so sad to see a man who lived loved and wrote with such humanity and humor should have his name buried forever. I think the family should claim it's name. That would be the best vindication and acknowledgement that they bestow on their father and grandfather as the case may be. You are absolutely correct. I agree! Thanks for reading the blog and for commenting!